When DMS faculty member Dudley Weider set out to climb North America's highest peak, it was supposed to be an adventurous vacation. But the expedition took a harrowing turn when Weider was called on to save several lives. Three very personal perspectives on death offer insights for both patients and doctors. Sharing their stories are the widow of a DHMC cancer patient; a faculty member who has studied the care of dying patients; and a DMS alumna whose own experiences with illness have affected the way she practices. Palliative carethe care of patients for whom curative treatment is no longer an optionis receiving increased attention nationwide, including at DHMC. The decision to go into medicine should not be made lightly, given the years of training and the financial burden involved. Yet how do premeds find out if medicine is really what they envision it to be? Dartmouth undergrads are getting a better view of the profession than ever, thanks to the DMS faculty. On the threshold of the new millennium, there are 142 new students in four different degree programs, a new chair for a brand new department, new research results, and more. The profit motive: What does it do to the cost of care? By Mae C. Jemison, M.D. 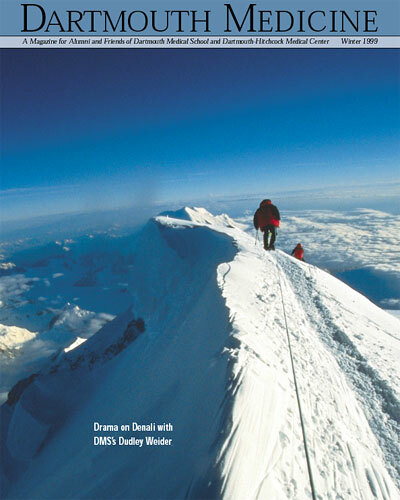 Development	(HTML) (pdf) 129 KB "Knights in shining armor"
Dartmouth otolaryngologist Dudley Weider was hoping to get to the summit of Denali in June of 1998. Instead, he was drawn into a series of dramatic rescues detailed in the story starting on page 20. The cover photograph, of two fellow climbers negotiating the summit ridge, is by Scott Darsney of Mountainworld Images (scott@mtnworld.com).